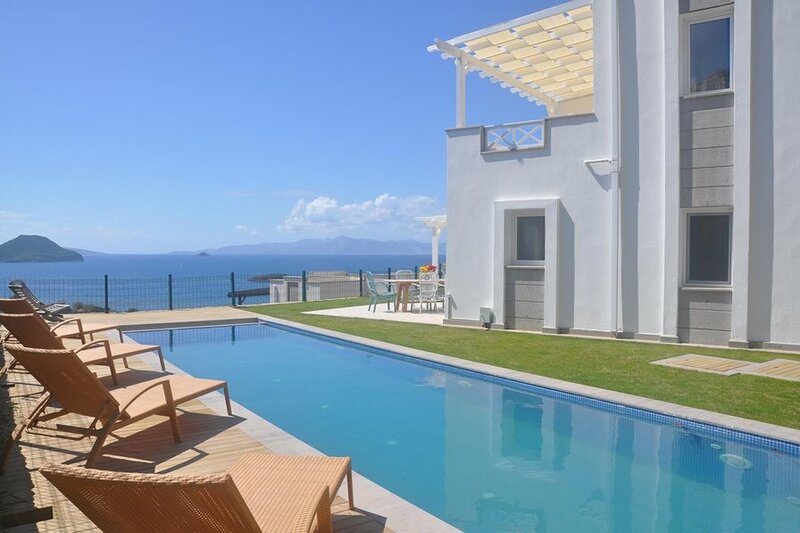 This 3 bedroom well-appointed duplex villa situated in a spacious garden with private infinity pool with a western facing panoramic sea view with an incredible sunset every night. The villa is perfect for a couple or a family looking for a private and relaxing holiday with spacious, fully equipped and comfortable accommodation. The pool is 10,50 meters by 3.5 with an infinity edge facing the sea. There are 4 sun loungers around the pool. The villa can accommodate up to 6 people comfortably. There are two queen sized beds on 2nd floor and two single beds on ground floor. There is a bathroom and toilet on 2nd floor and a toilet on ground floor next to bedroom. 2 of the bedroom air-conditioned units and the one on ground floor has fan/ventilator. The kitchen is fully equipped and offers all kitchen utensils. Both living room and kitchen sliding doors are opening to large balconies have 10 people seating group suitable for breakfast and dinner. The property is located 600 m from the sea and 450 m from the village of Kadikalesi with shops and sea side restaurants, many serving fresh locally caught seafood. Kadikalesi has a long sandy beach and several 5 star hotels. The location is preferred by those seeking a quieter and less crowded location. The historic fishing village of Gumusluk is located 2 km north, famous for the sunken Roman era city of Myndos, its Classical music festival and many fish restaurants. Turgutreis is located 3 km to the south, has a weekly farmers market a yacht marina with luxury boutiques and cafes, social events and an attractive atmosphere. In Bodrum centre there are many restaurants and night clubs. There is also a castle in the harbor, which is an impressive landmark in the region. Out of nearby Turgutreis (and Bodrum) it is possible to go to the Greek Island of Kos for a day and join daily boats trips to visit nearby islands and bays.